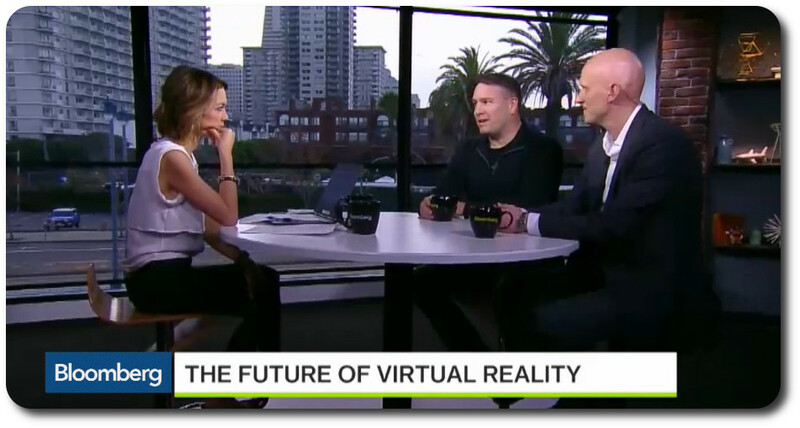 On Monday, December 7th, Linden Lab CEO Ebbe Altberg appeared alongside AltspaceVR’s CEO and founder, Eric Romo on Bloomberg Business with Emily Chang, to discuss How to Find Realistic Timeline for Virtual Reality. In the interview, which lasts just under 5 minutes, the three discussed the potential of VR including. The foundation for the interview is a report by TrendForce which proclaims the VR market will be worth around US $70 billion by 2020, with some US $20 billion coming from hardware purchases and US $50 billion from software and applications. It’s the latest in a bullish series of predictions on the future of the technology, many of which have gone unchallenged – and even then, TrendForce believe their prediction is an “understatement”. But how likely is it? US $70 billion represents a tenfold increase in market worth for an industry slated to generate around US $6.7 billion in 2016. However you look at it, that’s a pretty steep growth curve. Both Ebbe and Eric see it as “reasonable”, with the latter citing the idea that a lot of companies which might not be considered as “VR companies” seeing a value proposition in the technology and leveraging it within their business model. In particular, he refers to the expected upsurge in VR as a paradigm shift comparable to that witnessed with the smartphone revolution. We definitely believe the mass market … there’s going to be a lot of adopters, early adopters, of VR. but if you’re looking at the kind of smartphone scale, you know, billions of users out there, that’s going to take a long time. $70 billion by 2020 is more than extremely ambitious, $70 billion assumes that VR is a mature and mainstream market. There is no way that VR will explode into such a mature market within effectively 4 years. While I am extremely optimistic about the future of VR, such projections do nothing but hurt the future of VR by setting unrealistic expectations. There are no players in any part of the market that could turn this industry into a $70 billion industry in 4 years. During the Bloomberg discussion, there is an acceptance that VR needs to overcome certain technical hurdles to gain more of a mass-market appeal. Certainly, these issues – cost, reliance on high-end supporting technology, etc. – are real, and doubtless will be overcome. But they aren’t the single issue facing VR in terms of its adoption. Like it or not, VR is actually an isolating experience. Sure, you can in theory see anything, go anywhere, etc., while using it. But you do so at the expense of pretty much cutting you off from the rest of the world around you. It curtails your ability to properly interact with the things around you, to multi-task, etc. For many people and situations, even those seen as potential VR use-cases, that could curb the appeal. There’s something else as well to be considered when discussing VR and its potential; what might be called the elephant in the room: augmented reality. While AR is off to a slower start that VR, it is fair to say that it has the potential to reach into many of those markets and use-cases as seen to be ideal for VR, and offer a more attractive option in doing so. Initial AR systems are far more self-contained and portable; those on the horizon promise a wealth of capabilities (up to and including VR). More to the point, they do not isolate users from the world around them, something which could make AR far more practical and appealing for everyday use in the house, at work, on the street, etc. So, it could be said that AR appears to be a far more natural proposition for widespread adoption and use, becoming a far more natural evolution from (and with) mobile and smartphone technologies. Hence why some put AR’s market worth as being in excess for US $100 billion by 2020. Which is not to say that VR doesn’t have a place in the future. There are very niche and compelling cases where it will gain momentum. But whether it will ever reach the level of adoption comparable to the smartphone, as is so often cited, is questionable. There is no reason why, that for many of those potentially uses of VR outside of entertainment and gaming, AR might not offer a far better value proposition for take-up when compared to VR, leading to the latter being subsumed by it well before it has the opportunity to reach the scale of growth predicted for it. You can catch the Bloomberg video by flowing the link towards the top of this piece, or you can catch the audio below.